Some years ago when I was young and just married I was asked by someone whose name I don’t remember to host a dinner for Gloria Steinem at our house in San Francisco. My husband was always curious about meeting new people and very happy to host any number of gatherings for whomever I thought might be interesting. I remember being very nervous about meeting her and worried I wouldn’t measure up as a feminist. I wondered why I had been asked to host the dinner, not believing I could be considered a “liberated woman”. I read “The Feminine Mystique” when I was at Sarah Lawrence and discussed it at length in our freshman psychology class. In my heart I knew the author was right. We read Betty Friedan and Germaine Greer as well as Virginia Wolfe. All through elementary school I searched the stacks in our library looking for books about successful women. Finally I found a series of books about women like Florence Nightingale, Helen Keller, Marie Curie, and others and I read every book over and over. Looking back, without being tutored in the subject of female equality, I see that I was born with an instinctive sense that the world was not fair in its treatment of women. I observed this as a child and resented it without knowing how to address it. Sarah Lawrence was a great place to be in the early seventies as there was no question on the campus that women were smart, capable and creative. I found myself pondering how it felt to be treated as if I were interesting, intelligent and had an opinion that was worthy of an audience. I wondered why my father was paying the tuition. It was a heady feeling that stimulated me and terrified me at the same time. I knew I wasn’t stupid but I suffered from a lack of self esteem which made it difficult to express myself in class. It was easier to be successful with men: pretty and charming meant a lot then and still does today. It seemed to me that my choice was either to behave as I was expected to or “cause trouble”. In my father’s eyes, I caused a lot of trouble. So here I am, five years later in 1980, welcoming Gloria Steinem into my home with excitement and curiosity. The first good omen from the Ms. Foundation came in the form of the gift of a 16 mm movie called “Free to Be You and Me”, narrated by people like Marlo Thomas, Rosie Grier and others. We happened to own a 16 mm projector at the time and were able to show the film to our kids, I had only one child then , but until it was apparent in the mid eighties the projector had met its natural lifespan, most weekends I showed the film to one or two or three of my kids. I loved hearing Rosie Grier singing “It’s All Right to Cry” My daughter, Annabel, still sings it today and loved that movie. Looking back, it is surprising how my kids wanted to see the film over and over. We think that feminism is a thing of the past but that is not true. Women are still paid less than men for work that is similar. Heads of state are still predominantly male as are heads of corporations. Men are still treated as if they deserve more respect than women and as if they were more capable. Women stay in relationships that are abusive and violent because they live in fear of their men and because they don’t think they can live without them. Men have affairs and wives forgive them saying to themselves that it meant nothing and the family is more important. There are many women I know who are living out their lives in a relationship that is empty and desolate yet they are afraid to leave believing they cannot survive alone. They say if they leave their husbands or lovers there will be another woman who will take their place immediately and they can’t live with this pain. My mother refused to go to the movies alone saying that people would think it was pathetic she had no man to accompany her after the death of my father. Some women still believe they are incomplete without a man by their side. 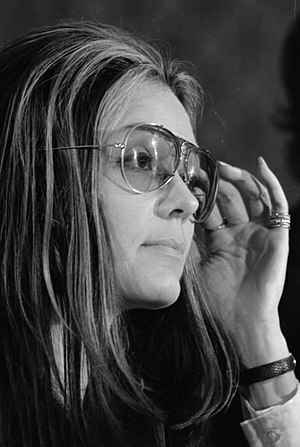 The other night I watched an HBO special on Gloria Steinem and I was in awe of her once again. We forget what it takes to go against the tide, to speak up for what you believe in, and to listen to the taunts of others who find your position so frightening they become enraged. Gloria Steinem is an amazing lady and my hat still goes off to her! She has lived a life devoted to her cause which is a common cause for all of us women. It doesn’t mean we hate men: quite the opposite! It means we ask for recognition and acceptance for being just as qualified and just as capable as men and deserving of the same respect in the world. I know she is now 78 years old and I hope she lives another 20 years as her work is very inspiring to me and to many women. There are few people in the world today, male or female, who would devote their life to a cause beyond all else. Without these people we would have neither social change nor progress. How wonderful it is to have Gloria still around and still fighting for all of us.